The Indian automobile industry on Wednesday showcased its vision for an all-encompassing electric-powered transport solutions at the pre-open day of the Auto Expo 2018. Besides, the rush of unveilings and new product introductions, the event also saw the entry of brands -- Kia Motors, Kawasaki and BMW Motorrad - in the Indian market. The 14th edition of the "Auto Expo -- The Motor Show" 2018 will be opened for the public from Friday. On Wednesday, 22 exhibitors unveiled over 65 products and launched 14 new offerings. On the first of the two pre-open days at the India Expo Mart located in Greater Noida, automobile major Maruti Suzuki showcased 'e-SURVIVOR' electric vehicle (EV) design concept. It also unveiled a new compact car design "ConceptFutureS". 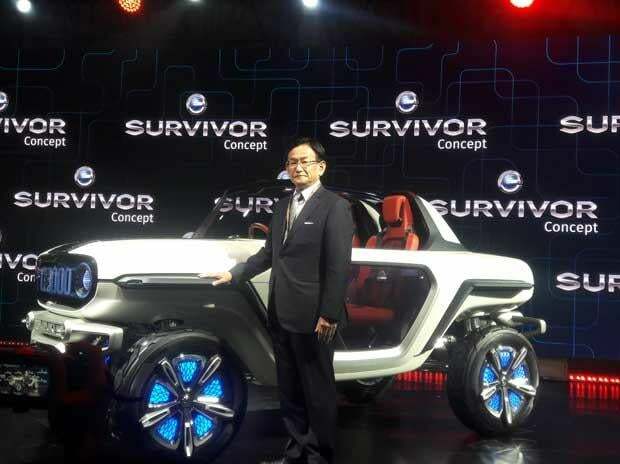 Unveiling the ConceptFutureS, Kenichi Ayukawa, Managing Director and CEO, Maruti Suzuki, said: "Our designers have created this brand new design, aggressive on the outside, and bold and inviting interiors. "Nothing like this has ever been attempted before on a vehicle this size. ConceptFutureS will define the next generation of design for compact vehicles in India." Automobile major Hyundai Motor India launched the '2018 ELITE i20' priced from Rs 534,000 (Rs 5.34 lakh) to Rs 790,000 (Rs 7.90 lakh) (ex-showroom Delhi) for the petrol variant. The diesel-powered version starts from Rs 673,000 (Rs 6.73 lakh). It also announced the launch of nine new models, including an EV in the Indian market by 2020. "We will launch nine new products till 2020. This includes two face-lifts (of existing models) two new segment (models), four full model changes and one electric vehicle," said Y.K. Koo, Managing Director and CEO, Hyundai Motor India. Commercial and passenger vehicle giant Tata Motors unveiled two new passenger vehicle concepts, including a five-seater luxury SUV "H5X" and a premium hatchback "45X". The two vehicles are based on two new architectures introduced by the company: Omega Arc and Alfa Arc. In the commercial vehicles segment, the company introduced a compact truck "Tata Intra", which was unveiled by the company's brand ambassador and Bollywood actor Akshay Kumar. The event also saw Mahindra & Mahindra unveil a wide range of EV concepts including, an electric bus "e-Cosmo", a two-seater electric pod "UDO", a lithium-ion battery-powered electric three-wheeler "Treo" and eKUV100, India's first electric mini SUV. Apart from its electric vehicle portfolio, the company also unveiled India's first convertible SUV "TUV Stinger" and SsangYong Motor's new G4 Rexton, which will be launched in India with an all-new brand name. High-end automobile manufacturer Toyota Kirloskar Motor unveiled the "B-High" segment car "Yaris" which is seen as its most anticipated launch this year. At the event, Honda Cars India said that it will introduce three new models in the Indian market during the next fiscal. "We are committed to the Indian market and aim to launch six models in the coming three years," said Takahiro Hachigo, President and Representative Director, Honda Motor Co. In the two-wheeler space, the Auto Expo 2018 saw the official entry of Kawasaki into the Indian market. Other manufacturers such as Honda Motorcycle and Scooter India unveiled a total of 11 two-wheelers, including a new 160 cc motorcycle "X-Blade". Two-wheeler heavyweight Hero MotoCorp unveiled a 200cc adventure motorcycle "Xpulse". It also unveiled two scooters -- "Maestro Edge 125" and "Duet 125" -- at the expo. "The new scooter range -- Maestro Edge 125 and Duet 125 -- will be introduced in the market by the second quarter of FY19, while the on/off road bike XPulse will be launched ahead of the festive season to delight the thrill-seekers in India," Hero MotoCorp said. Suzuki Motorcycle India unveiled a 125 cc scooter "Burgman Street" along with the introduction of the GSX-S 750 bike at the Expo. "The Burgman Street is scheduled for a launch in 2018," the company said in a release. Another two-wheeler manufacturer Piaggio India launched the scooters "Aprilia SR 125" and unveiled the "Aprilia Storm". The luxury automobile segment saw Mercedes Benz and BMW Group India launch high performance and ultra-luxurious vehicles and motorcycles. Mercedes-Benz launched its Maybach S 650 and teased its E-Class All-Terrain model for its upcoming India debut. The company also launched its Made-in-India BS-VI Mercedes Maybach S 560 to continue Maybach's popularity in India. While the S650 model would cost Rs 27.3 million (Rs 2.73 crore) (ex-showroom), the S560 would be priced at Rs 19.4 million (Rs 1.94 crore), the company said. BMW India launched the high-performance sedan M5 priced at Rs 14.3 million (Rs 1.43 crore). The company's first-ever BMW 6 Series Gran Turismo was unveiled by legendary sportsman Sachin Tendulkar. On the group level, BMW unveiled the next-generation of all-new MINI Countryman which will be locally-produced at its plant in Chennai.